Adding a new skill to your sewing repertoire, like learning to use an overlock machine, can be an exciting time, and you’re probably eager to get started. The Brother 1034D has a reputation for being the perfect machine for beginners. And after taking a look at the features on offer, it’s no real surprise. This machine does everything that any beginner or even experienced sewer could ask for. And it does it for a great price, too. But before you invest your money in this machine, we’d like to help you familiarize yourself with all its best features and perhaps even explore a few of its quirks. 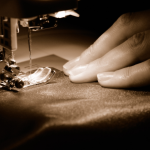 No sewing machine is a custom fit for every buyer, and every sewer has their own list of must-haves when they buy a new machine. Even though the Brother 1034D is well-priced, it pays to learn more about the machine and whether it will meet your expectations before making the purchase. An overlock machine is similar to a traditional sewing machine, but it has very specific stitches for providing a professional-looking finish. Also called a serger, it's a superior choice for working with soft, synthetic fabrics or those with lots of stretch to them. Your new overlock will create tight, trim, and very strong seams and edges once you learn to master it. 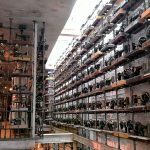 Instead of using a single needle to push the thread through the fabric and a bobbin to hook it, an overlock machine uses two needles and up to five bobbin threads to lock a seam and prevent it from fraying. A serger wraps the stitch around the seam, and then automatically trims off any excess allowance. Overlock machines are particularly suitable for creating sportswear, sleepwear, and children’s clothing. The overlock stitch, depending on your settings, gives each seam some give, perfect for active children or adults on the go. If you plan on making sleepwear, playwear, or even sportswear, the Brother 1034D could be the right machine for your needs. 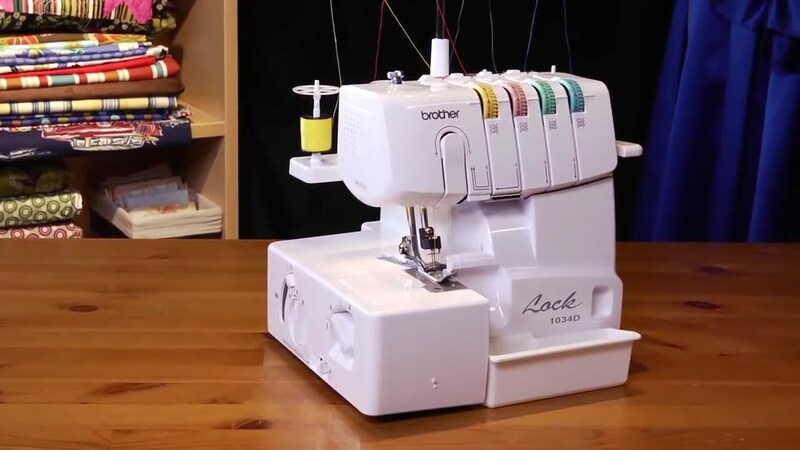 The Brother 1034D is a favorite starter machine for many new to sewing. Priced re, it still generates rave reviews from even the most experienced sewers. If you’ve never used an overlock machine before, threading the machine may seem overwhelming at first. One of the most highly lauded features of the Brother 1034D is the color-coded and numbered threading map for both upper and lower loopers printed right on the machine. Brother has also included an instructional video and printed guide. The guide and map walk you through the entire process, showing you just where each of the threads should go. Even better, it features a lay-in threading system. So, it shouldn't be long before you are setting up your next sewing project in just a few minutes' time. There are 22 built-in stitches altogether, using either three or four thread overlock settings and including ribbon lock stitches and both rolled and narrow hem stitches. It also includes pre-programmed stitches for home décor projects and formal wear. The standard foot and gathering foot included with the machine allow you to create lovely embellishments like ruffles and spaghetti straps. If you plan to work with soft, woven fabrics, you’ll appreciate the differential feed, which ensures that your fabric doesn’t pucker or bulge at the seams. This feature also supports working with fine, delicate fabrics, like taffeta and satin, for creating items such as lingerie or bridal wear. Best of all, even though the Brother 1034D stitches 1,300 per minute, the differential feed manages to keep up and keep your seams smooth and flat even at high speed. The 1034D also features individual thread tension for all needles, which means you have total control over each stitch. The ability to move the cutting knife away from the workspace means you can sew without fear of snipping off anything critical to your project by accident. The Brother 1034D features a bright LED light to illuminate your workspace, making it much easier to see your stitching. This light is a significant benefit to sewers with poor eyesight and those who like to keep working into the small hours. The worktop converts easily from a flatbed to a free arm, making it possible to sew collars and cuffs. The free arm lets you sew in tight places, which is perfect for making children's clothing and stuffed toys. Out of the box, the Brother 1034D offers two presser feet, but optional feet are easy to find, and they snap in quickly. Adding simple waistbands is a breeze with the Brother SA212 elastic presser foot. To create decorative piping, use the SA210 piping foot. One of the benefits of a buying a trusted brand is the range of options the manufacturer provides for extending the useful range of the product. Brother took customer feedback to heart and released the 1034DX in response to complaints about the placement of the controls on the earlier model. On the 1034D, many of the setting knobs are located on the left side of the machine, leaving right-handers annoyed. Otherwise, it has the same stitch options, differential feed, and thread capacity. The main difference, at this point, lies in the price tag. Its easier to use if you're right-handed, but the price difference may cause you to think differently. The SiRUBA HSO-747 overlock machine can boast many features but doesn’t have the same name recognition as the Brother models. It offers two, three, and four thread options with a differential feed. However, the threading map is tiny and hard to read. And it doesn’t boast the same range for the overlock seam width, which narrows your options for future alterations. It could be a bargain, but it only carries a one-year warranty and doesn’t come with comprehensive instructions. And since the company’s distribution to the U.S. is still rather limited, spare parts and experienced service are hard to come by. All of these add up to potential frustration for any buyer. 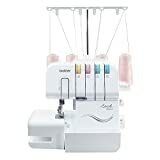 Another overlock machine under the $200 mark, the Costway Portable Serger offers a range of features at a bargain price. Costway is a 10-year old startup that offers a range of proprietary products online. As for their overlock machine, there’s no threading guide printed on the machine. And there’s hardly room for one on this compact serger. The “color-coded threading” only refers to colored numbers on the thread dials, which are useless once they’ve worn off. It offers two, three, and four thread stitches and boasts a differential feed. It’s a little slower than the Brother model, but at a maximum of 1,200 per minute, not by much. In addition, the stitch width options are much narrower than those offered by the Brother model. However, one of the more attractive features of this lesser-known model is the low price tag and compact size. On the downside is the fact that they don't clearly state an extended warranty. However, you do have the option of purchasing a two-year protection plan for less than $10. Is the Brother 1034D the Right Overlock Machine for You? Now that you’ve taken a look at its best features and most annoying glitches, you may still be wondering if the Brother 1034D is your best buy for the money. If you’re left-handed, you’ll have no trouble using this overlock machine. If you’re right-handed and have difficulty with left-handed tasks, it may be worth the extra money for the 1034DX model. That said, since releasing the 1034DX model, you can find the Brother 1034D model at a steep discount. The current Amazon price at the time of this review was a nifty $179.98. 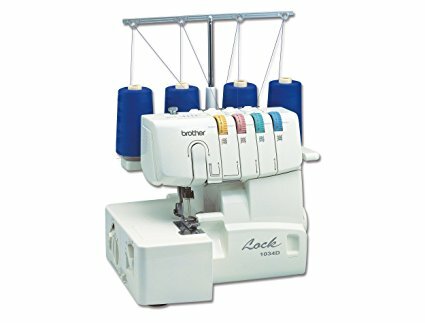 Brother has manufactured sewing machines for the home market since the mid-1950s, and you can’t go wrong with free phone support for the life of your overlock machine. Dependable construction and a host of stitching options make the Brother 1034D an excellent choice for any sewing enthusiast. And most importantly, the customer support provided for any Brother sewing machine is both extensive and impressive. Brother 1034D overlock sewing machine is an extremely reliable and durable model that offers a lot of excellent features. This is a user-friendly sewing machine that is equipped with great features. However, this model doesn't hem heavier fabrics and it only has two presser feet included.